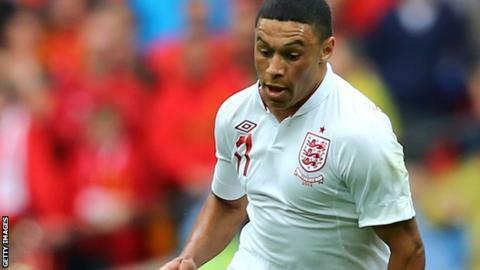 Teenager Alex Oxlade-Chamberlain says England want as few alarms as possible as they try to book their place at the 2014 World Cup finals. England start their bid to get to Brazil in Moldova on Friday and face Ukraine at Wembley four days later. "You want qualifying wrapped up as soon as you can so we'll be looking to push every game," said the Arsenal winger. England striker Jermain Defoe added: "They're two big games and if we can win them it will be good for everyone." England last failed to reach a major tournament as recently as Euro 2008, while the last time they missed a World Cup was in 1994. They begin their campaign under Roy Hodgson in Chisinau on Friday without injured strikers Wayne Rooney and Andy Carroll, which puts more onus on England's attacking players. But Oxlade-Chamberlain, 19, said: "It's not just a responsibility on us, there's a responsibility on everyone - we're playing for England. "There's goals all over the team. I think Phil Jagielka scored in the last game. "We'll be all looking to score. I don't think there's too much pressure on one individual position." Tottenham forward Defoe scored the winner when England won their last game 2-1 against Italy in a friendly and may be deployed in a lone striker role against Moldova. "I think it will be a difficult game," he said. "You look at the fixtures and some might think it should be an easy game. It's important to be professional and patient and it helps when you get an early goal. "It's going to be difficult and the first 20 minutes will be really important."